Prime Credit and Sub-Prime Credit. 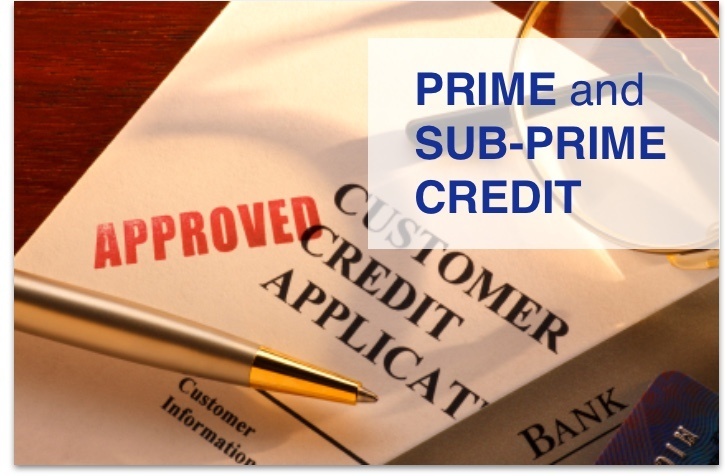 Prime Credit is simply a statement of what type of credit an individual has. Ratio of loans vs income, history of payments, number of loans and credit cards, amount financed vs down payment, equity in security etc… Many of our customers qualify for "prime rate car loans" even though they don't expect to. In general, people with good credit history usually enjoy preferred rates when applying for vehicle financing. Sub-Prime is a term used to describe a loan that will require a higher level of interest charged. It usually is categorized as an individual who has experienced some challenges in their payment histories and therefore do not qualify for preferred prime rate offers of financing. An adverse credit history can also be referred to as “non-status credit history”, “impaired credit history”, ‘poor credit history”, and “bad credit history”. Simply stated, this is a negative credit rating and banks charge an interest rate that is directly related to the banks perceived ability to collect their loan without default or late payments. We deal with all of the following situations on an hourly basis: Great Credit, Good Credit, Bad Credit and No Credit.